Pictured is an artist's rendering of human red blood cell. Park et al. show that dynamic remodeling in the coupled membranes (lipid bilayer and two-dimensional spectrin network), powered by adenosine 5’-triphosphate (ATP), results in nonequilibrium membrane fluctuations and also maintains the biconcave shape of RBCs. Photo - Image courtesy of Alex Jerez, YongKeun Park, Gabriel Popescu, and Subra Suresh. 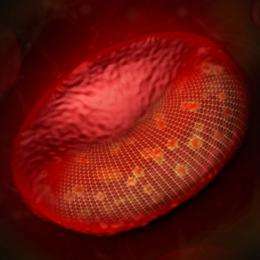 (PhysOrg.com) -- Much like a tightly wound drum, red blood cells are in perpetual vibration. Those vibrations help the cells maintain their characteristic flattened oval or disc shape, which is critical to their ability to deform as they traverse blood vessels in the body to deliver oxygen to tissues. The researchers used diffraction phase microscopy, which quantitatively measures the vibrations in the cell membrane in real time. The optical phase delay, a measure of how much the light is delayed as it passes through the cell, changes as the membrane vibrates. They found that when ATP was depleted in red blood cells, vibrations decreased by 20 percent. When ATP was reintroduced, vibrations increase back to the normal level. They also found a direct correlation between the ATP-induced alteration to membrane vibrations and the length scale of the cytoskeletal structure. The researchers are studying how specific proteins associated with malaria infection of red blood cells affect cell membrane stiffness and vibration, and developing sensitive new diagnostic techniques. More information: “Metabolic remodeling of the human red blood cell membrane,” YongKeun Park, Catherine Best, Thorsten Auth, Nir Gov, Samuel Safran, Gabriel Popescu, Subra Suresh and Michael Feld, Proceedings of the National Academy of Sciences, week of Dec. 21, 2009.